23 Saturday December 7th 1895 Will took the chickens to town this morning. Seth helped me wash. After dinner I cleaned up the kitchen and scrubbed porches. It was a nice day. I made Wills nightshirt before bed time. He was down town after dinner. Sunday December 8th 1895 As soon as the morning work was done, we got ready for church. It was not cold to go. I got dinner as soon as I got home. I had some things to see to that I did not get much time to read. I got the clothes down ready to iron tomorrow. I read all the evening. 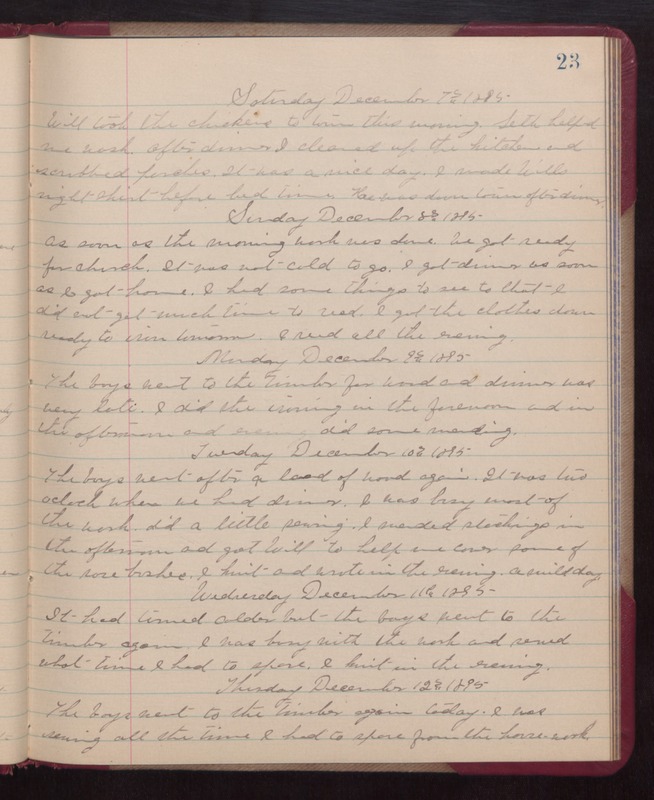 Monday December 9th 1895 The boys went to the timber for wood and dinner was very late. I did the ironing in the forenoon and in the afternoon and evening did some mending. Tuesday December 10th 1895 The boys went after a load of wood again. It was two oclock when we had dinner. I was busy most of the work, did a little sewing. I mended stockings in the afternoon and got Will to help and cover some of the rose bushes. I knit and wrote in the evening. A mild day. Wednesday December 11th 1895 It had turned colder but the boys went to the timber again. I was busy with the work and sewed what time I had to spare. I knit in the evening. Thursday December 12th 1895 The boys went to the timber again today. I was sewing all the time I had to spare from the house-work.